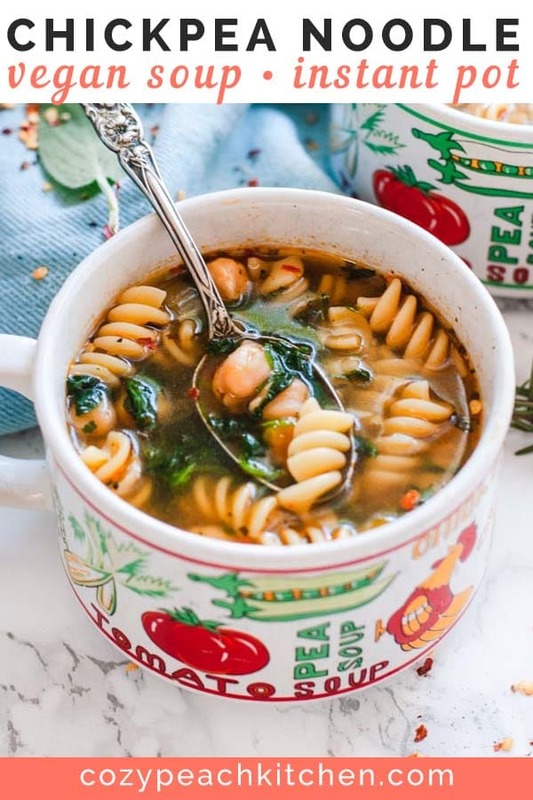 This cozy chickpea noodle soup is made in the Instant Pot using fresh herbs and dry chickpeas. It’s the definition of healthy vegetarian comfort food! Let’s talk about comfort food. In case you haven’t noticed, this blog is all about it! The classic idea of comfort food, especially here in the South, is that it’s greasy, probably fried, and often “unhealthy”. And while many aspects of traditional comfort food do lean towards this definition, comfort food doesn’t have to be like that. For me, comfort food is something that makes me happy and comfortable, makes me cozy, and it often brings up good memories. That’s why comfort food is different for everyone; for some, it may be that fried tofu (or chicken!) sandwich from your favorite restaurant, while others find comfort food in traditional family recipes. 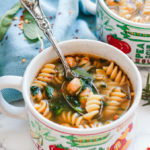 The varying definition of comfort food is why I love this chickpea noodle soup. It’s just one of those classic foods that fit the comfort food definition perfectly. That’s why I’m so excited to share it as part of November’s Recipe Redux. This month’s topic is (you guessed it) soup! So perfect for this crisp fall weather and upcoming winter colds. 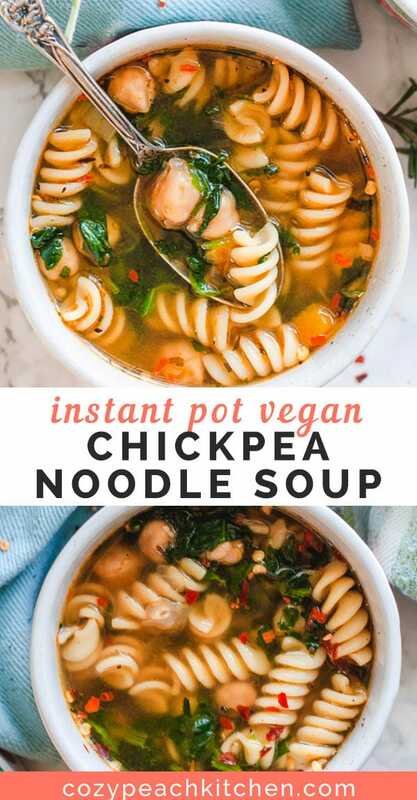 Chickpeas + noodles = chick(en)pea noodle soup? 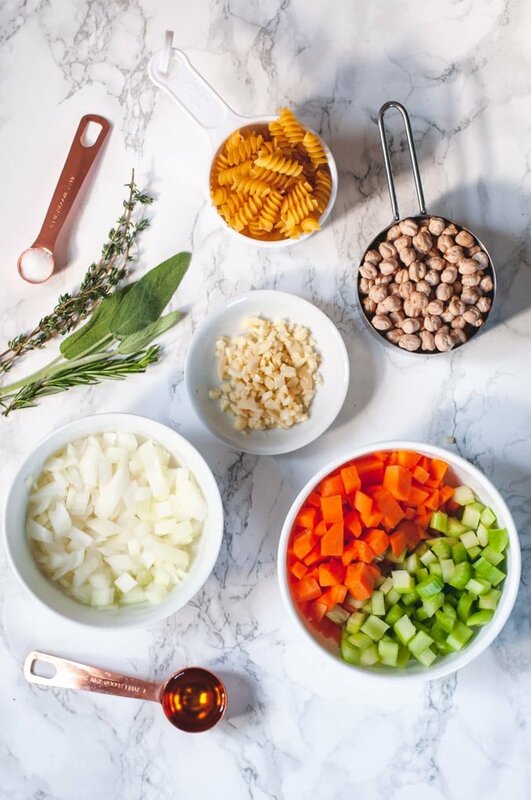 Chickpea noodle soup is of course a play on one of the most classic comfort foods of all: chicken noodle soup. Since us non-meat eaters love using chickpeas as a punny alternative to chicken (ahem – chickpea salad sandwiches, anyone? ), chickpea noodle soup is the natural vegetarian progression of chicken noodle soup. Chickpeas, also known as garbanzo beans, are high in protein and rich in nutrients. 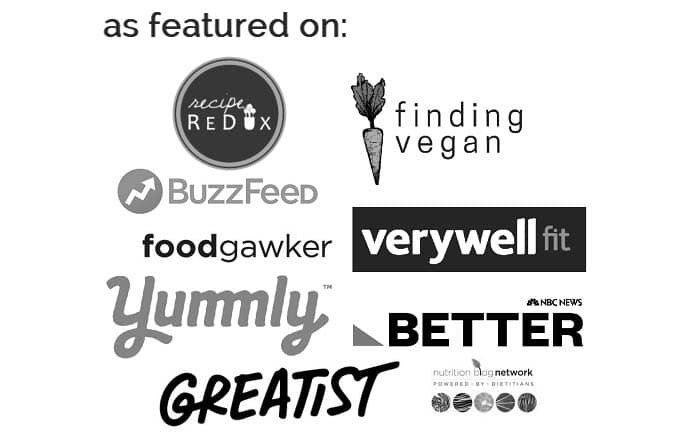 They make a great meat alternative for those looking for a filling meatless soup. 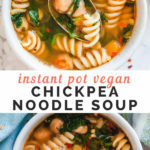 With this Instant Pot recipe you can cook chickpeas from dry (without pre-soaking!) in 35 minutes, plus the time to bring your Instant Pot to pressure and to release pressure. 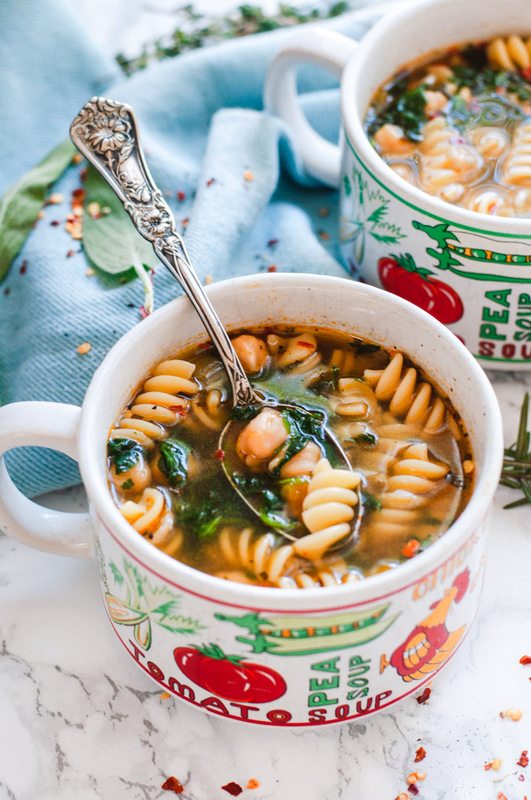 All said and done, you’ll have healthy, warming chickpea noodle soup on the table in just over an hour. 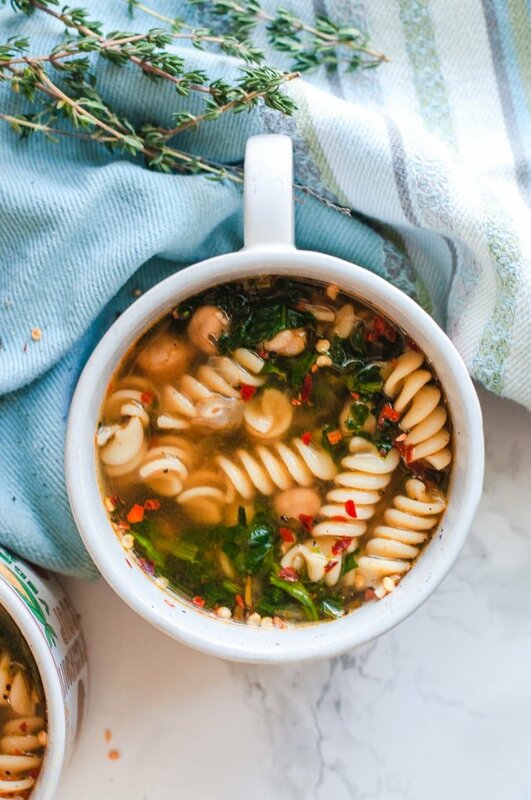 Good news: the savory broth flavors infuse over time, so this soup is just as good (if not better!) three days after being made. I had it for lunch every day this week and I think I actually liked it better each day! Saute. Start by sauteing your onions, carrots, and celery in a bit of olive oil until the onions are translucent and starting to brown. Sprinkle with salt. Add the garlic and saute for a minute more, until aromatic and browned. Seasonings. Next, add the chopped fresh herbs: rosemary, sage, and thyme. This is where the savory broth is born. Add the paprika and a bit of salt, and maybe a dash of cayenne pepper if you like your food hot. Chickpeas. Mix in the dry chickpeas, vegetable broth, and water. You can use 100% vegetable broth if you prefer, but I use water and broth to cut down on the sodium content. Cook on high pressure for 35 minutes, then let the pressure release naturally. Test your chickpeas for doneness; if they’re not as tender as you’d like, you can cook on high pressure for 2-3 more minutes. The Instant Pot will reach pressure quickly since the soup is already hot. Choose your pasta. I like my chicken noodle soup with small noodles, like the fusilli in the picture. If you use one of these small noodles you can throw it straight into the Instant Pot while still dry. Long strand like fettucine or spaghetti will also work if broken to fit in the Instant Pot, but they may stick together a bit while cooking. Cook the pasta. Cook the chickpea soup and noodles on high pressure for 4 minutes, then release the pressure manually. Alternately, cook your pasta on the stove and add to the soup once the chickpeas are done. Stir in the cooked spinach. I use frozen spinach because it’s inexpensive, easy to heat up in the microwave, and nutritionally equivalent to fresh spinach. Add the cooked spinach to your finished soup. Season with lemon juice and black pepper. Enjoy! Serve with freshly baked garlic knots or crumbled jalapeno pimento cornbread. In the mood for more soup recipes? 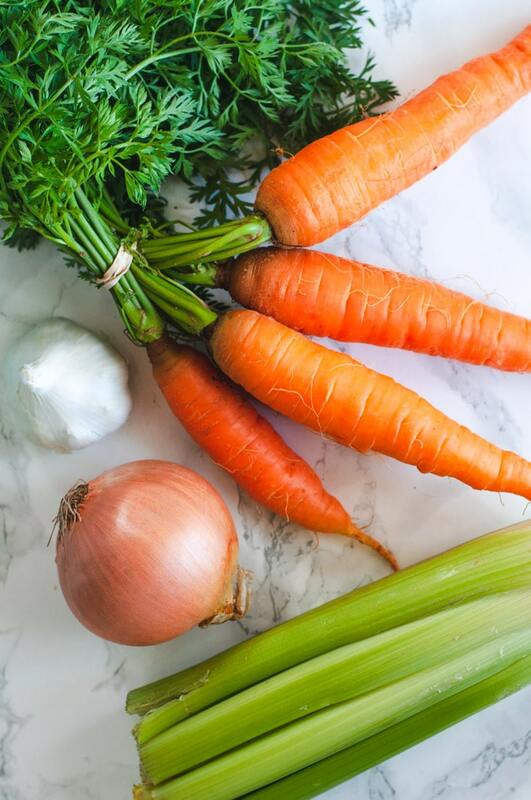 And don’t forget to check out the other “Souper Soup” recipes that are part of this month’s Recipe Redux by clicking on the link below. 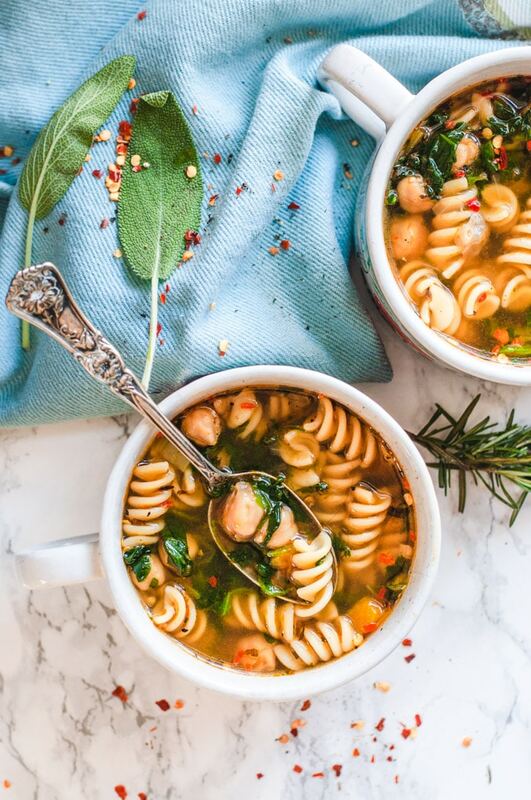 This vegetarian alternative to classic chicken noodle soup is made in your Instant Pot using fresh herbs and dry chickpeas. Rinse the dry chickpeas and sort out shrunken chickpeas or debris. Set aside. Set your Instant Pot to the saute function. Saute celery, onions, and carrots in the olive oil for for 5-6 minutes, or until onions become translucent. Sprinkle with salt. Add the garlic and saute for a minute more. Add the fresh herbs and seasonings and give a stir. Pour in the vegetable broth, water, and dry chickpeas. Lock the lid in place and set the vent to sealing. Cook on high pressure for 35 minutes. It will take about 10 minutes for the Instant Pot to come to pressure. Once the 35 minutes is up, allow the pressure to release naturally; this takes 15-20 minutes. Once the pressure is released, remove the lid and add the dry pasta to your Instant Pot. Reseal the lid and place the vent to sealing. Cook on high pressure for 4 minutes then manually release the pressure. Careful, hot steam will come out; I usually wear an oven mit when I manually release the pressure. Stir in cooked spinach. Season with black pepper and lemon juice. Enjoy! A package of "poultry herbs" can usually be found in the fresh herb section at your grocery store. This usually contains rosemary, thyme, and sage, the fresh herbs called for in this recipe. You can substitute 1 teaspoon of fresh herbs for 1/4 teaspoon dry. If you are short for time or want to use a bigger pasta, like linguini or fettucine, I recommend cooking the pasta on the stove according to package instructions. Long pasta can be cooker in the Instant Pot but it may be unevenly cooked or need to be broken to fit in the pot. Chickpeas not done? Older beans may need more time. Just reseal the lid and heat on high pressure for 2-3 more minutes. Release pressure naturally. Repeat as needed.